Searching for a place on the beautiful Lagoon in Bacalar? Look no further! The Yak Lake House is right on the water with an amazing view that will make you never want to leave. Come and spend some time in paradise! The facilities include a private dock that stretches out into the lagoon with a breath taking view of the sunrise and we are located right across the lagoon from the infamous Pirate Cove! For those who want to explore the lagoon, be sure to check out the boat tours to Pirate Cove, the cenotes, and more! Free breakfast is served daily. The Yak Lake House is located right on the beautiful lagoon and only 2 blocks from the famous St. Felipe Fort Museum and city centre. While walking for less than 5 minutes, you can find restaurants, markets, the health centre, and artisan stands for jewellery and souvenirs. We are located about a 15-minute walk from the ADO bus station, which is situated just outside of town on the highway. 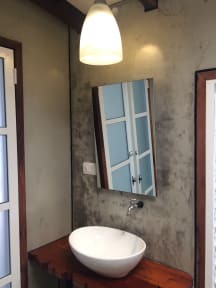 The Yak Lake House offers comfortable accommodation in both private rooms and shared dorms, all with private bathrooms. Each room has powerful fans and A/C to keep you cool at night. For those who are not trying to completely disconnect in relaxation-mode, we have Wi-Fi throughout the premises. Check-in time starts at 1 pm. Check-out time is 11 am. Late checkouts will be charged MXN 50 per person. Children cannot be accommodated in the hostel; every guest must be 18 years or older. Upon check in, you will be asked to pay a MXN 100 security deposit for lost keys, late checkouts, or damages. It is strictly prohibited to possess or consume any type of illegal drugs in the hostel. Anybody found using drugs will be turned over to the authorities immediately and banned from the hostel. Vandalism is taken very seriously. Anything destroyed must be paid for by the person responsible. The hostel provides security facilities for your convenience, but is not responsible for anything stolen or lost on its premises during your stay. Alcohol cannot be brought into the hostel. Nice hostel, perfectly situated at the lake. They organise a lot of excursions and activities in the hostel itself. The night we arrived there was live music and a camp fire. The hostel has its own bar, nice breakfast as well! Really nice and clean hostel. The Yak got her own dock, so it’s easy to go for a nice swim in the lake. And the breakfast is really worth it! Beds are comfortable and showers are really nice to. There is a big kitchen so if you want to cook, there’s space enough. It is simply a very good hostel. It’s new, clean and at the right spot. Breakfast is good! Unfortunately it is not that spacious outside, but was not really a problem. 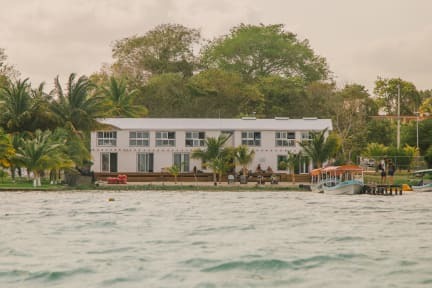 If you are looking for a nice hostel in Bacalar, you should be here! When this hostel is fully booked, go to Hostel Calma. Thatwas also very good and more spacious, but a bit less of the social vibe. Enjoy! De yuk lake house is perfect to chill and relax. Next to a lake with a good few. The only thing that could be better are the organised tours. The are not very good with communicated with that. The rest was good! Heel mooi uitzicht, leuke excursies en een clean hostel. Personeel niet echt mee gecommuniceerd, was echt een clubje, waardoor het meer als een bar aanvoelde dan als een tweede thuis. Props voor claudio en Hector van Whatsup Bacalar, ze zijn echt goed! Party hostel or not? Decide for yourself because to give you a headsup: music is on till midnight and at least loud party music till as long as it’s crowded at the bar (23:30 in my case). If you want to go to sleep early this might be challenging, especially when your room is next to the bar and you have to wake up early (06:15) for the sunrise sub tour (which is awesome by the way). I think think this is a shame because the rest of the hostel is awesome and the location is perfect. Very nice looking hostel, great view. So that was very nice. But very rude staff. Most of them. Very on the rules, screaming at me a few times a day why I didn’t have my wristband on. I’m a costumer. You can ask me friendly but not be rude. I’m not paying 20 euros a night to be screamed at by some bitchy staff. Was at the point to ask for the manager, but just got out off there. Great place, but you need to work on being nice people who stay there. Would not stay here again. Sheets are yellow instead of white and the shower was dripping all night. I am to old for this kind of hostel. You are just a number. So glad I didn’t stay here with christmas.